Playing Rugby Union for Canon Eagles. Slaimankhel was born in Pakistan to Afghani refugees. When he was two years old his family moved to New Zealand. Slaimankhel grew up playing rugby union until he switched codes to join the New Zealand Warriors rugby league development side. He played in the first XV for Auckland Grammar School, where he was also a track athlete and weightlifter. 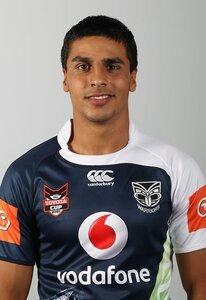 He played for the Junior Warriors in the Toyota Cup and was named in the 2011 Toyota Cup team of the year. Slaimankhel made his first grade debut on 16 June 2012 against the Cronulla Sharks, playing on the wing in place of an injured Manu Vatuvei. He played a total of 5 matches for the Warriors but received substantial criticism for his poor performances, and the club eventually told him that they were not interested in resigning him. Slaimankhel came off contract at the end of 2012 and was pursued by several National Rugby League clubs. However he instead returned to rugby union, signing with the Canon Eagles in Japan.